Saturday started out overcast and chilly but the sun was out and hot by the time we closed. The morning was quiet with very little singing going on this late in the season. 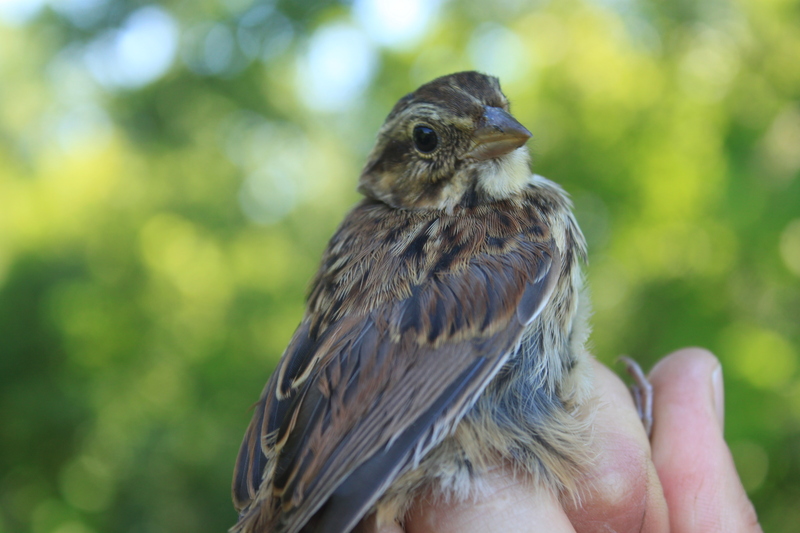 A total of 20 new birds and 8 recaptures of 13 species were banded. 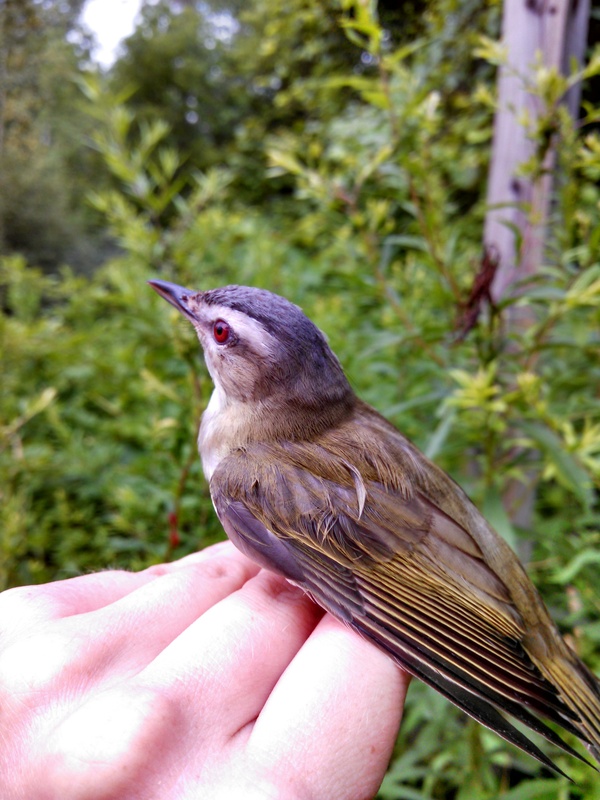 and a surprise Red-eyed Vireo! This brought us up to 27 species for the season. Thank you to all the volunteers who came out to help! The fifth MAPS session at HANA was a beautiful, cool morning with birds on all but the last net run. We finished with 23 new and 14 recaptures of 10 different species. 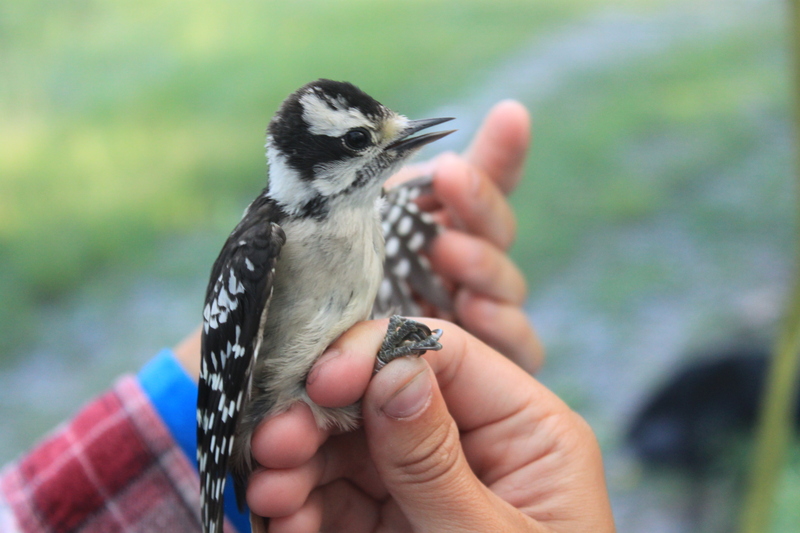 Many of the birds caught this session were juveniles. Along with the usual Yellow Warblers and Gray Catbirds we added two new species for the season. 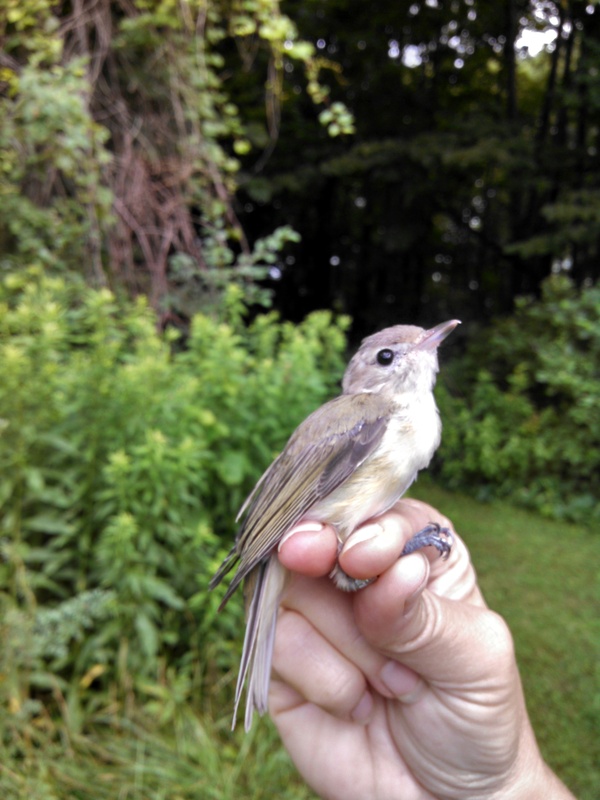 The first, a Warbling Vireo, has been caught at HANA in the past. The second, had been heard in the area earlier in the week and we were told to listen for it. 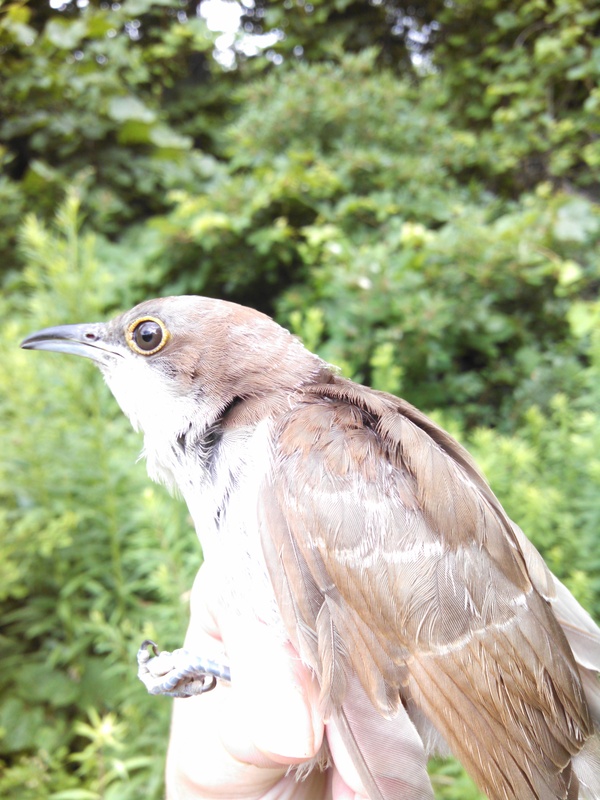 Although we did not hear the bird, we did manage to catch a SY Black-billed Cuckoo, which was a brand new species for the HANA MAPS station! This bird topped off a great day of banding. Henry and Becky got the Station ready. Shortly after Mr. Olsen and I arrived we set up nets with Henry. The nets were open at sunrise on a nice Sunny morning. We also had help from Lisa and Ethan for the day. Becky’s friends from Texas joined us once again. And they brought homemade breakfast bake and Dunkin Donuts. Becky brought her famous chocolate cookies and she made Almond butter Cookies. Bird of the day Song Sparrow with 6 banded and we also had 4 brown thrashers. 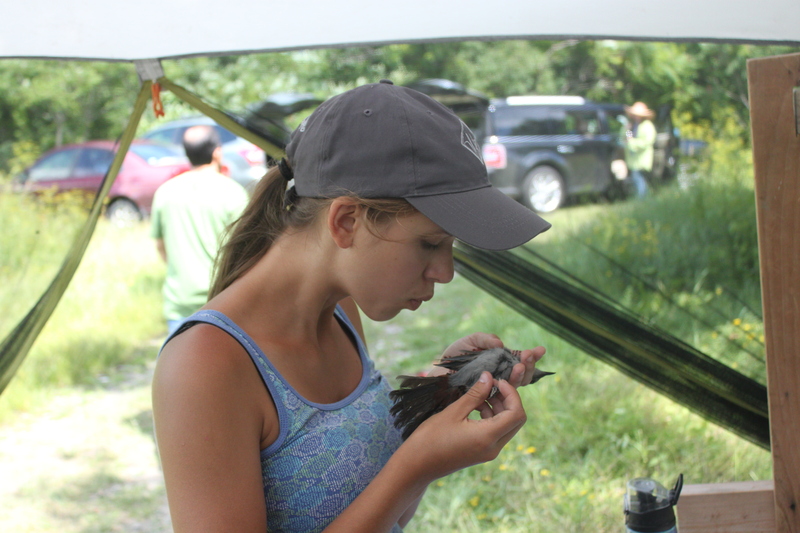 Becky banded a couple of birds to get on the score board for top bander. 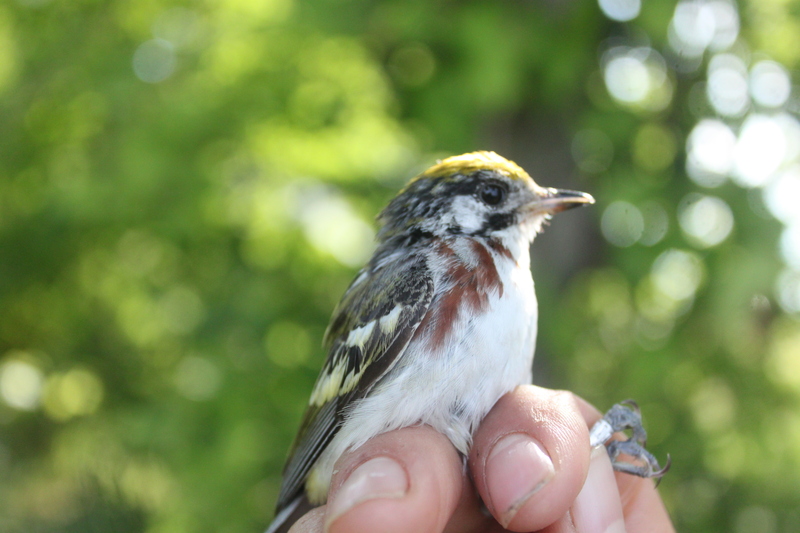 But the highlight was a Dead Creek first – a female Chestnut-sided Warbler. It looks like it will be the bird of the year. 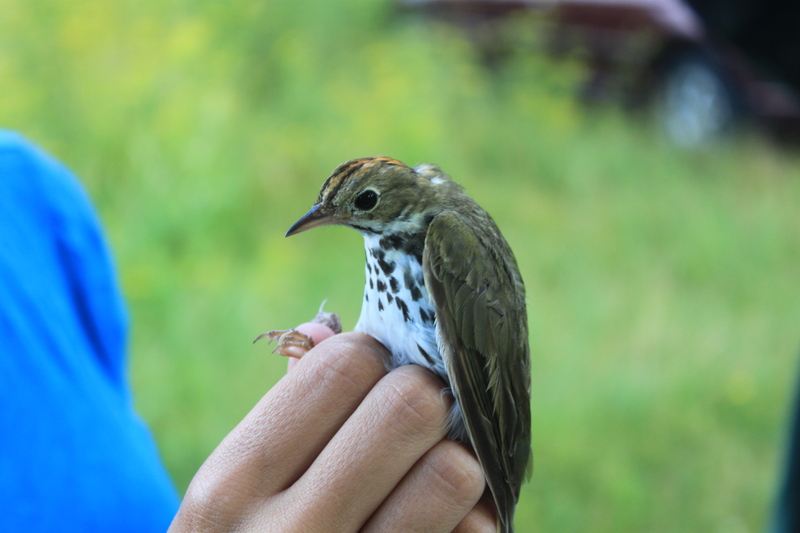 Also we had two more Ovenbirds and a Veery which is new for the season. July 6,2014 26 new and 15 retraps. Henry and I arrived at Dead Creek at 4:46am to set up the station and then we went to open the nets. As we were going to open the nets Claire and Becky drove in to the station! Becky brought her delicious muffins. Claire and me did most of the banding. Henry banded a bird to get added to the scoreboard for top bander! Ryan has been top bander for the past two years. Who will it be this year? Ryan seems to have the lead for now. But that could change. Bird of day was Gray Catbird with 6 banded. Becky’s friends from Texas came back and have coming back five years. Usually they come for two or three Maps sessions. This year they could make it four. 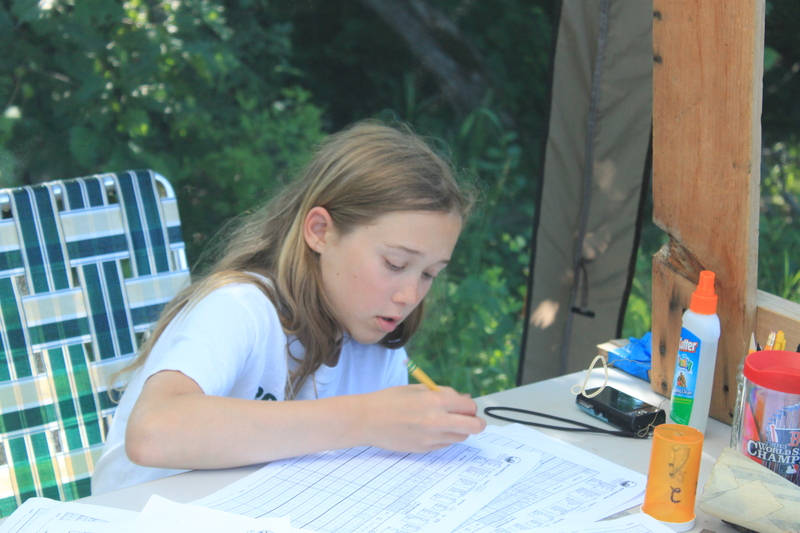 July 5, 2014 10 new birds, 12 recaps, of 10 species. The weather was cooperative and pleasantly cool for the fourth MAPS session at HANA. The birds were not so cooperative. We had a very slow day with ten new birds and twelve recaptures of ten different species. The fledglings continue to trickle in. 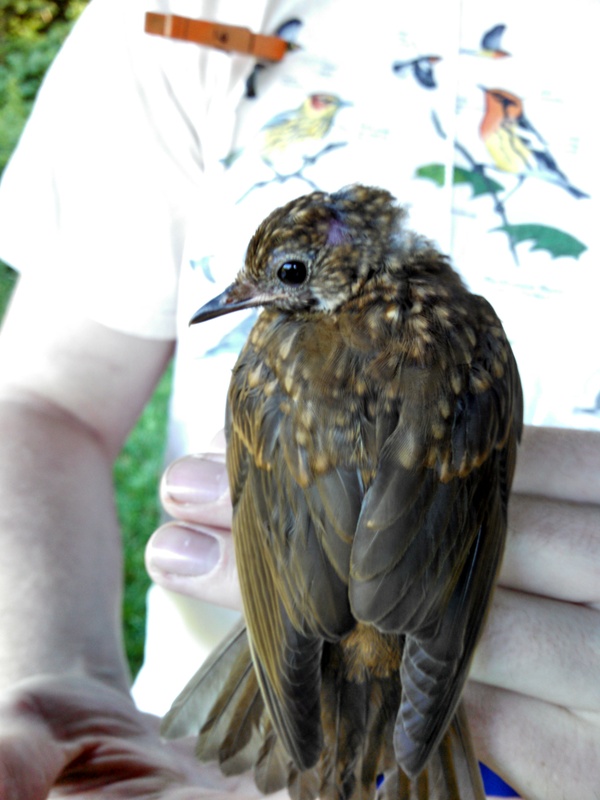 We caught the usual Yellow Warblers and Gray Catbirds with the addition of a juvenile Veery. There were many birds singing around the area and some Cedar Waxwings stopped by the station. Thank you to all the volunteers who managed to get up early the day after the 4th of July. Friday June 27,2014 19 19 new birds and 13 retraps. Once again it was a very small crew, with Henry, me and Mr. Olsen. nets when Mr. Olsen drove in. Along with him were Ian and Ryley. the fog was gone. 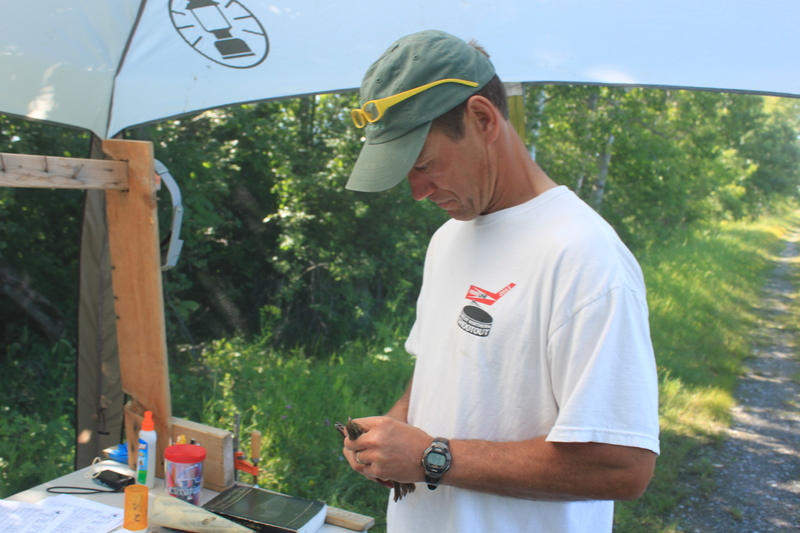 Mr. Olsen and I banded, and checked nets 1-5, while Henry picked the back nets. Bird of the day Song Sparrow with 6 banded. try to take a fish out of an Osprey’s talons. But it looked like the eagle didn’t have any luck. 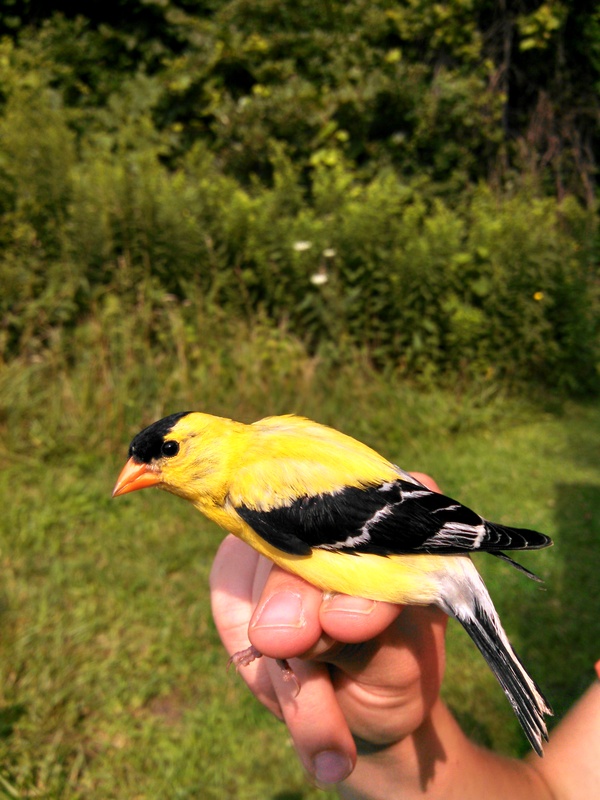 Our next banding day will be Sunday July 6.